Know2Go mission is to provide internet Users, registered members and subscribing members with timely, quick access to event information happening around the world. In addition, the service gives you a direct URL link to the events website, links to purchase tickets and find travel information. 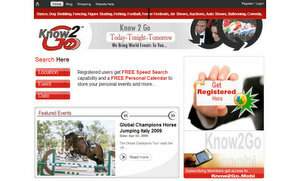 To find an event, Know2Go provides 3 methods of search; by location, by event, and by date. Although the service does not require registration, there are benefits to actually register. For instance you will have "Speed Search" capability and you will be able to submit events and images, in addition to posting “favorite events” found in the database to a personal calendar which allows you to instantly list most common holidays on your calendar. Awards and Film Festivals, Cricket, World Cup Soccer, Olympics, Football, Motor sports, Industry Conventions, Fashion Shows, Billiard Matches, and more… are examples of the type of events covered. I have joined Know2go recently and use their .mobi function a lot. It is just great to know where 2 go, everywhere, everytime all the time. Sounds like a slogan doesn’t it? Anyway join this website.